AUSTIN, Texas (AP) — James Cotton, a Grammy Award-winning blues harmonica master whose full-throated sound backed such blues legends as Muddy Waters, Sonny Boy Williamson II and Howlin' Wolf, has died at age 81. A statement from Alligator Records, Cotton's label, says he died Thursday of pneumonia at St. David's Medical Center in Austin. The Mississippi Delta native performed professionally since age 9. Cotton backed Muddy Waters in his landmark album "At Newport" on Chess Records. After going solo in the 1960s, Cotton released almost 30 albums, including his 1996 Grammy Award-winning Verve album, "Deep In The Blues." His most recent album, "Cotton Mouth Man" for Alligator Records in 2013, was nominated for a Grammy. Cotton began his professional career playing the blues harp in Howlin' Wolf's band in the early 1950s. He made his first recordings in Memphis for Sun Records, under the direction of Sam Phillips. In 1955, he was recruited by Muddy Waters to come to Chicago and join his band. Cotton became Waters's bandleader and stayed with the group until 1965. In 1965 he formed the Jimmy Cotton Blues Quartet, with Otis Spann on piano, to record between gigs with Waters's band. He eventually left Waters to form his own full-time touring group. His first full album, on Verve Records, was produced by guitarist Mike Bloomfield and vocalist and songwriter Nick Gravenites, who later were members of the band Electric Flag. 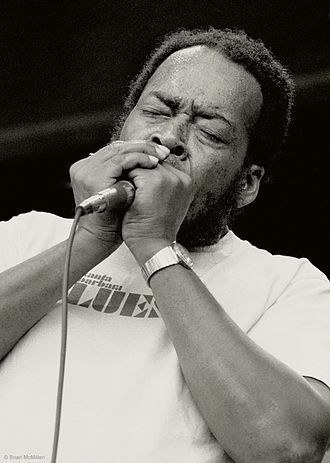 In the 1970s, Cotton played harmonica on Waters's Grammy Award–winning 1977 album Hard Again, produced by Johnny Winter.